The location was just off Highway 270 near Gaithersburg Maryland. The "Take It " was only tempered by my question if my camera had the oomph to capture the splendor of the show I was witness to with the wonderful full moon. Earlier that eve there was a lunar eclipse, which I did not see as I had to go to bed early. For the moon to put on this kind of early show was simply amazing. 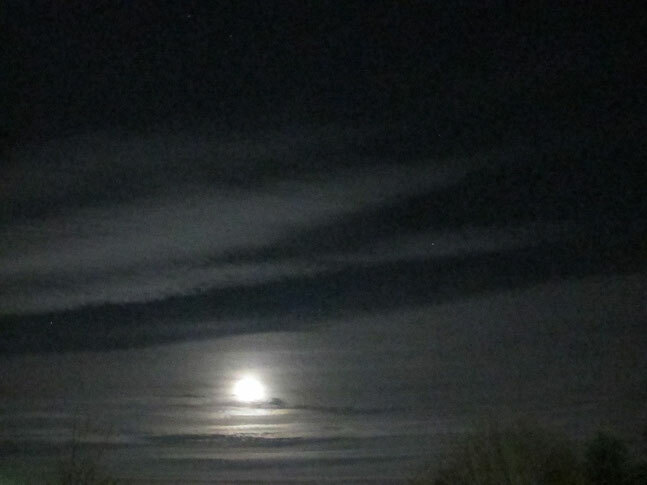 The clouds were in horizontal lines and I just happened to catch the moon inbetween two lines of clouds. I had pulled the car off the road and found a place with next to no overhead lights to optomize my chance to catch the shot. I took four shots and this was the best. It is not very crisp, but I just had to share it. It may sound strange but when I come upon a setting for a what I hope will be a good or maybe even a great shot, I sometimes think it would be great to have a group with me to share in the experience and have them shoot it too. The After Take: I am grateful that the shot came out as good as it did. Some of the resolution was lost on the camera, but the core of the setting is still there. All this taken into consideration finds those to whom I have shown it to thinking it is a cool shot. Hope you do to. This would have made a great Eyellusion. The moon really looks like it is setting over water. Wait thats not water!? Lol....great photo Bruce! Eerie, yet peaceful. Very nice! You mean that's NOT over water? Even eerier. It's look art like some little thing falling in the water and gives shine in the dark . It's so amazing. So the archived photo's are previously featured photo's I'm guessing? Either way, this picture seems oddly fitting for 12/21. Beautiful shot.